Nibbling is a London-based company owned by the Canadian-born entrepreneur and fashion designer Emily Sunderland Sutter. Emily is a devoted mother, blessed with three beautiful children, all of whom are younger than five years. Her own inner child is an artist and she obtained a degree in visual art from Canada and attended College LaSalle Montreal and Central Saint Martin. After a while in the fashion world as a designer and merchandiser, she now has her energy focused on her bliss, children and jewelry. The assortment started with teething problems and bracelets and was extended with dummy clips, biting toys and now silicone placemats. Our designs are playful, versatile and colorful - a reflection of Emily's personality and creative background. The many jewelery of nibbling is not only safe to wear her children, but also fashionable for a night out or a day at the beach (preferably Ibiza!). 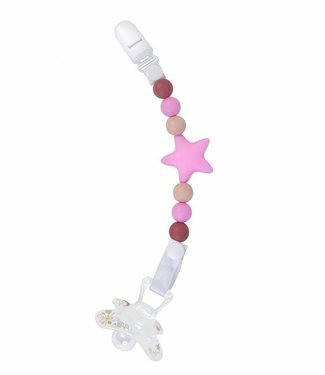 New and original Stellar pacifier clip is a fun and safe way..